At a city council workshop several weeks ago, a simple way to save hundreds of thousands of dollars was put on the table by the highway department. 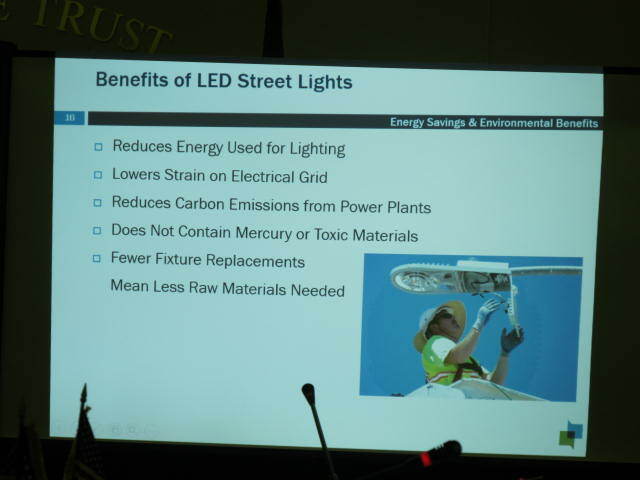 And at last Monday’s city council meeting, Wendell Energy Services, LLC, outlined a plan to install LED street lighting, which it says will significantly reduce operating costs for the city. The workshop was focused on the capital budget plan, with department heads from the police, fire, water and sewer, and roads making presentations and explaining some of their budget item requests. Among the presenters, highway department road engineer John Russo outlined several road projects coming up, notably Rombout Avenue and Phillips Street. The work on Rombout is slated to begin next year. It will include new sewer lines, new storm drainage lines and structures, installation of new sidewalks and installation of new road sub-base and pavement. The projected cost to taxpayers is $2,831,404. 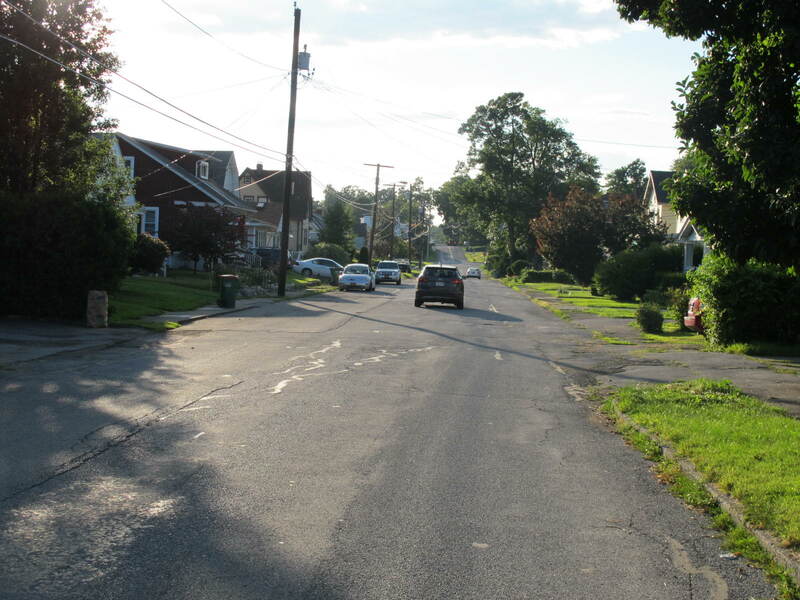 Mr. Russo said that Beacon could save $400,000 on Rombout and $350,000 to $400,000 on Phillips (scheduled for 2017 in the capital plan) by making the roads narrower in places where they are beyond the required dimensions for residential roads. In addition to saving money, road narrowing has other benefits, including safer streets and less runoff into the sewer system. Other roads coming up in the current capital plan that are overly wide include North Walnut north of Verplanck (2021, $2,529,232) and North Elm (2022), also over $2.5 million. Rombout Avenue from the corner of Teller looking east. Narrowing the road could save us almost half a million dollars. With road infrastructure such a large part of expenses, the City should mandate these dimensional roadway changes going forward on all eligible residential streets. With the economy doubtful, anything we can do as a community to decrease our future debt load makes sense, especially if at the same time it also increases public safety and puts less of a burden on our sewer and stormwater systems. 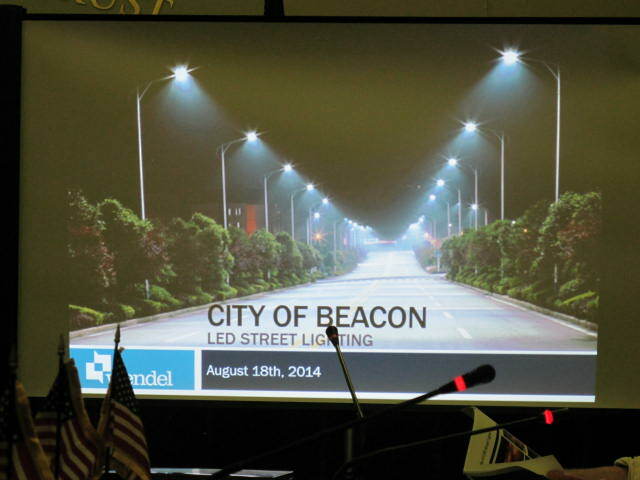 At the city council meeting on Monday, August 18, consultants from Wendel Energy Services presented a proposal to convert Beacon’s street lights to LED. The LED project as drafted also includes LED traffic signals, wireless street cameras, and LED improvements to City Hall. 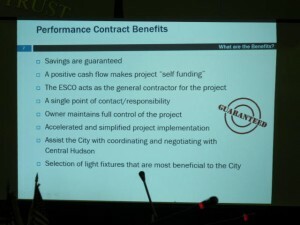 The project as outlined is estimated to cost just over $4 million. The project would save about 800 thousand kWh, with energy cost savings of $61,865 annually. The one-year environmental savings would include a reduction of CO2 of over 2.5 million pounds, or the equivalent of removing 234 cars from the road. LEDs are available in a range of color temperatures. One of the advantages of LEDs is that they have more uniform light distribution, reducing shadow areas. They also render truer colors. And of course they last much longer and require less maintenance. They do not attract insects. 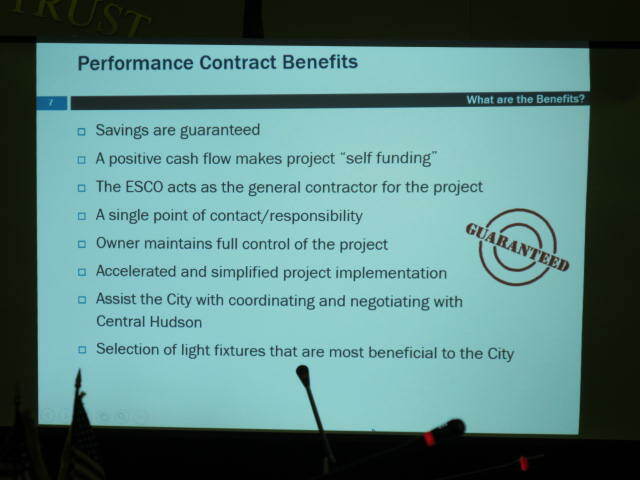 According to the presentation, the project would generate a positive cash flow, essentially paying for itself, including buying out the fixtures from Central Hudson and making dept payments on the bond, with money left over. It’s also what is known as a performance-based contract. In other words, the results are guaranteed—if the promised savings do not materialize, Wendel will cut a check to the city for the difference. Wendel has already completed phase I of an energy performance contract with the city, which included significant energy upgrades of the wastewater treatment plant process, as well as building envelope improvements to city buildings.